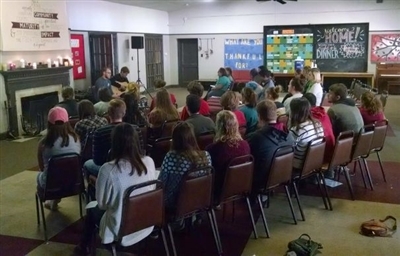 TALLAHASSEE (UMNS) -- The shootings at a Florida State University library early Thursday had United Methodists on that campus gathering for prayer and mutual support. “Everyone’s pretty emotionally shaken,” said Rev. Mike Toluba, pastor of the Wesley Foundation at FSU and Tallahassee Community College. FSU Wesley students gather for prayer in the wake of gunfire on campus that injured two people and ended with the shooting death of the gunman by police. Photo from Rev. Mike Toluba. Feature photo of campus prayer service at FSU fountain by Alvaro Galbaldon, Florida State University. A man opened fire at Strozier Library about 12:30 a.m. Nov. 20. Three people were shot, including two students, with two hospitalized and one released. Police shot and killed the assailant. The Associated Press identified the latter as Myron May, a lawyer who earned an undergraduate degree from FSU. The victims’ names had not been released as of Thursday afternoon. Toluba said he had no indication any Wesley Foundation student was injured or had been in shooting range. -- Sam Hodges is a staff writer with United Methodist News Service.